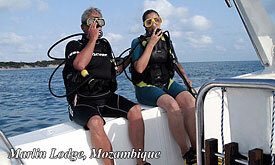 Here are opportunities to water-ski, yacht, Knee boarding and water snaking for the adventurous bird watching excursions or a leisurely cruise while enjoying the spectacular sunset over the Indian Ocean. Romantic picnics on deserted beaches of breathtaking white sand. 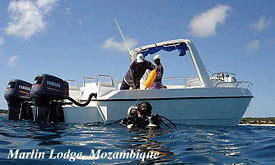 Then, of course there are the underwater attractions of this abundantly populated area of ocean. The Bazaruto Archipelago, of which Benguerua Island is a part, was declared a National Marine Park in 1971. 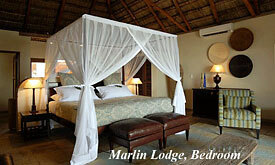 On visiting Marlin Lodge you will quietly praise those who had the foresight to protect the area. In the shallow water, small, nervous fish nibble brightly colored coral and playful dolphins disturb the occasional somber dugong. Further out in the deep channels lurk those creatures that so many come to this area to see Marlin, Sailfish, Wahoo and others that provide an equal challenge. Kingfish, Queenfish, Dorado and Barracuda come in with the tide to do some angling of their own.There are two ways to closely experience this aquatic beauty: go down to it - clad in a wetsuit and with a tank on your back - or bring it up to you with the help of a sturdy fishing rod. Each has its own rewards - swimming through coral forests with dolphins as your companions for instance is a heady experience. But few experiences come close to the thrill of hooking a Marlin. The fish on the deck means a proud picture, an epic story for the folk's back home and succulent steaks for dinner. A sudden slacking of the line, however, means a return trip to paradise and that, somewhere out of sight the symbol and essence of Marlin Lodge live on. 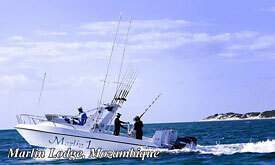 Back on shore, the wood, Luxury Marlin lodge welcomes the exhausted explorers. Drift into a somber rest with the sound of the waves lapping gently against the beach. Pansy Island is situated ½ hour north of Benguerua Island. Enjoy lunch which is set up under colorful umbrellas and rugs, spread out on pure white sand. Water sports are also offered or take a quiet stroll along the beach to search for the unique Pansy Shell. 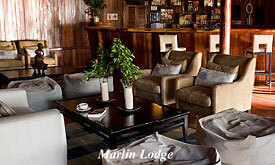 When the day is done and the sun is setting, surrender to the resounding African splendour that is Marlin Lodge. Rekindle your soul and allow yourself to be captivated by the allure of a relaxed way of life. 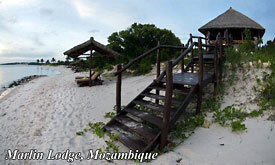 A timber sanctuary, a paradise on stilts - Marlin Lodge promises definitive, self-indulging repose like no other. For those seeking restoration and reawakening, a visit to the Beauty & Wellness Spa Centre will soothe the sun-basked body and clear the mind. Marlin Lodge offers a small, intimate wellness centre with an internationally qualified therapist to look after all your wellness needs. Our treatment menu offers a wide range of massages, reflexology, aromatherapy, facials and hand and foot treatments. We also provide helpful tips and suggestions in our monthly newsletter. 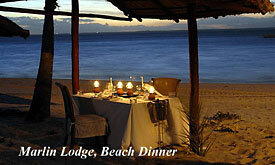 Luxury Beach Suites for cosy and intimate accommodation. Marlin Lodge offers a total of 14 Luxury Beach Suites, each with a sea-view and only a few steps from the white sands of Flamingo Bay beach. Each 60 m² Beach Suite has a 17 m² veranda, perfect for a private dinner or lunch for two, or for watching a breathtaking Mozambican sunset. The Beach Suites have practical yet sophisticated designer finishes, including slated flooring, plastered surfaces and soft lighting. 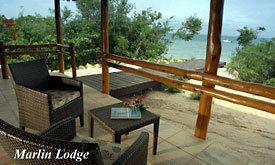 We accommodate a maximum of 2 guests per Private Luxury Suite. 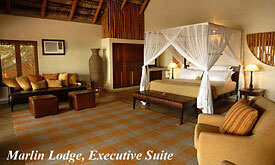 These spacious suites have their own inimitable style... resonating with Afro-chic elegance and refined furnishings. Earthen creams and oceanic blues blend in perfect harmony with the island's ambience, while softly lapping waves and palm-hushed breezes ensure a restful night's sleep to soothe and renew. The Executive Beach Suite's sheer size makes it unique. With over 80 m² of floor space and a 30 m² veranda, this suite is the perfect haven for the discerning visitor. Similar to the Luxury Beach Suites, the interior has sophisticated finishes such as slated flooring, plastered surfaces and soft lighting.